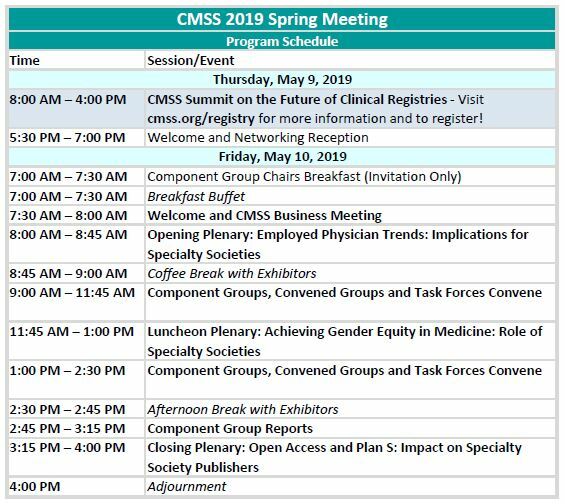 The CMSS Spring Meeting is a great opportunity to meet with Component Groups, receive updates from CMSS Leadership, and hear from invited plenary speakers address emerging and critical issues across specialty societies. The full 2019 Spring Meeting Program is now available – Click here to download the Spring Meeting Program. Please note that Component Group meetings and agendas are still being finalized. We’re delighted to announce our Plenary Speakers at the 2019 Spring Meeting! Click the links below for more details related to CMSS Meetings.